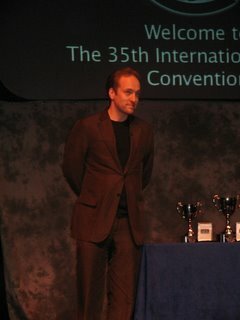 Last weekend saw the 2006 edition of the International Magic Convention - aka "Ron's". The Convention, started by Ron MacMillan some 30-odd years ago (hence the nickname) and continued now by his son Martin and daughter Georgina, brings some of the best magicians from around the world to perform and lecture for us, with a heavy emphasis on Close Up. The people brought over are generally names that have been mentioned in the magic "underground" and therefore are generally seen at Ron's a year or 2 before the other big UK Conventions book them. This year, I stayed at the Generator Hostel in Central London, not far from where the Convention was taking place. A great atmosphere in the place which seemed to be full of Australians when, in fact, it was packed with people from most countries around the world. The Convention was excellent with my personal highlight being the one person I was wanting to see lecture and perform - David Regal. David was set to lecture, perform in the Close Up Show and the Gala Show (they were getting their monies-worth from him!) but he was also very approachable late at night in the bar where people could walk up, say hello and ask him whatever about anything he had performed over the weekend. I ended up sitting talking with David for at least 2 hours on the Saturday night with the 2 of us showing each other tricks and sleights all over the place. 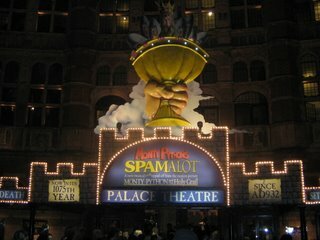 My other highlight can be summed up in 3 words - MONTY PYTHON'S SPAMALOT. Lovingly ripped off from Monty Python and the Hold Grail, this was THE FUNNIEST SHOW I HAVE EVER SEEN! The songs were brilliant and getting to quote along with the French Taunter and the Knights of Ni was great fun. The only thing that would have made the night better would have been if all the remaining Pythons walked onstage to take a bow. There were nods to the likes of the Parrot Sketch and The Lumberjack Song, and there was even an appearance from one of the most popular comedy songs of all time (I won't spoil it for you!). Suffice to say I LOVED the show (bet you're surprised to read that!) and will happily go back and see it again. And again. And again once it starts touring! 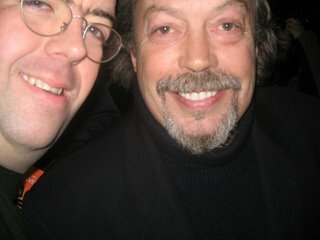 I even got to meet Tim Curry - King Arthur himself!!! One of the main parts of this Convention is the Close Up Competition that can make reputations for performers - as well as a cool £1,000 for the winner. This year's competition featured 12 performers and in the end it was Marc Oberon who took the top honours and the prize money over James Brown who took £500 for second and Dynamo who took £100 for third. This year has been a good year for excellent Gala Shows and the show that finished off Ron's was no exception. Noel Britten was his usual funny, brilliant self as MC and with acts such as Tina Lennart, Mike Caveney and David Sousa (who won second place in Manipulation at this year's FISM World Championships) on the bill, it was sure to be great. However, it was Australian Raymond Crowe who, in my opinion, stole the show with his brilliant mime, manipulation and hand shadows act. He also had one of the best floating object routines that I have ever seen! If he is appearing near you, I urge you to go see him! Brilliant stuff. To round off the weekend I went to stay with my friend Julie and her family overnight and, for the first time ever, I went to The Magic Circle at their headquarters in Central London. What an amazing building it is! There are amazing artifacts all over the place from props and equipment owned and used by Harry Houdini to posters of pretty much every major performer of the last 100 years. I hope to get back there once again before too long. Fascinating stuff.